These are a few screen shots demonstrating Simrads new Fish Reveal which you can get as an update from Navico for Simrad or Lowrance if your unit will accept it. The left screen is downscan with reveal turned on and the right screen is broadband 200khz sonar. 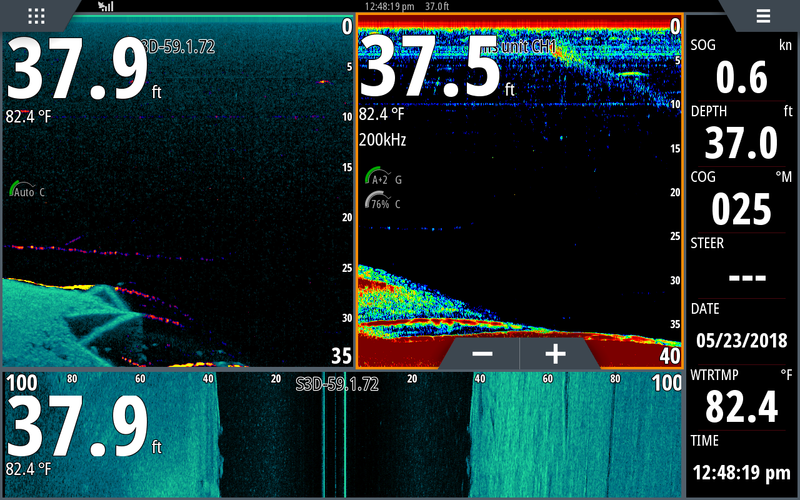 On the sonar side of the screen the larger Stripers are showing up with red in the center of the arch and the smaller fish are a yellowish green color. Each arch is a Striper, just different sizes. We are actually hooked up and fighting two Stripers out of this school as you can see in the center of the shot .On the reveal side of the screen each fish show up with more definition and are color coded as to the size of the fish. The better the return the brighter the arch shows up. Now these are not perfect arches because these fish are streaking and feeding. 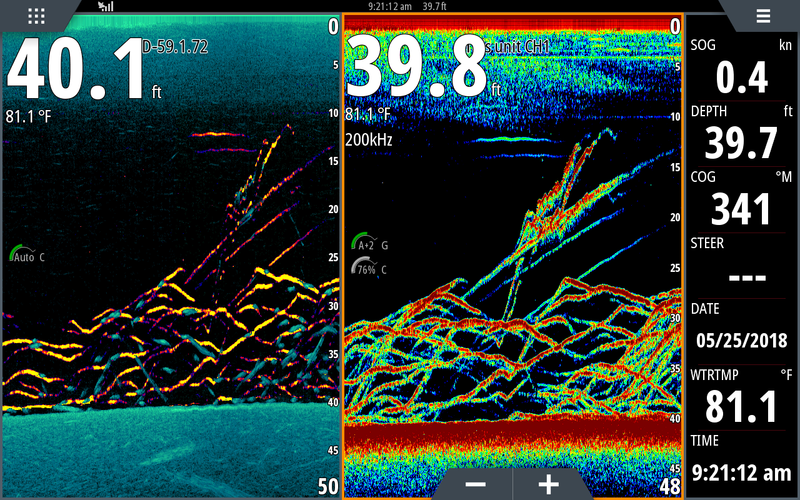 When I see perfect arches under the boat the fish are not active and I do not work them. This morning myself and my guides caught over 200 Stripers working areas where we located feeding Stripers on our depth finders. This is another shot earlier in the morning of Stripers as they were beginning to school. 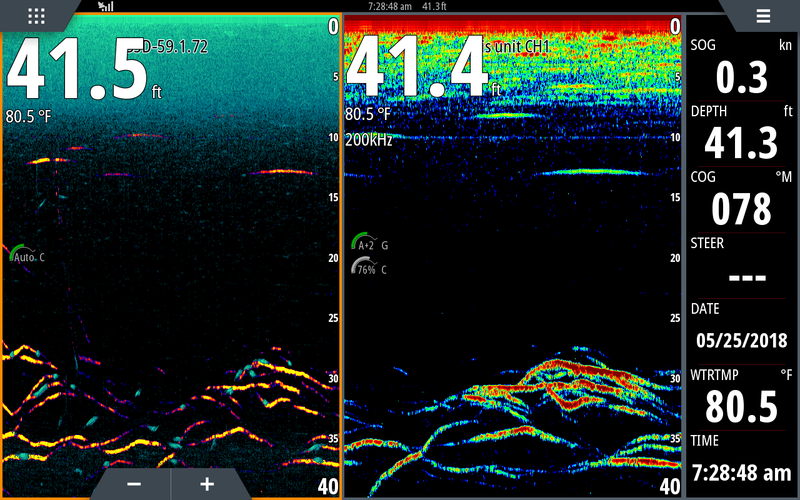 Notice again in the downscan screen how clearly you can see each fish and evaluate their size. These fish were also feeding as you can see their streaks swimming upward on the right side of the shot. Just a couple minutes earlier than the other shot fish trying to school. 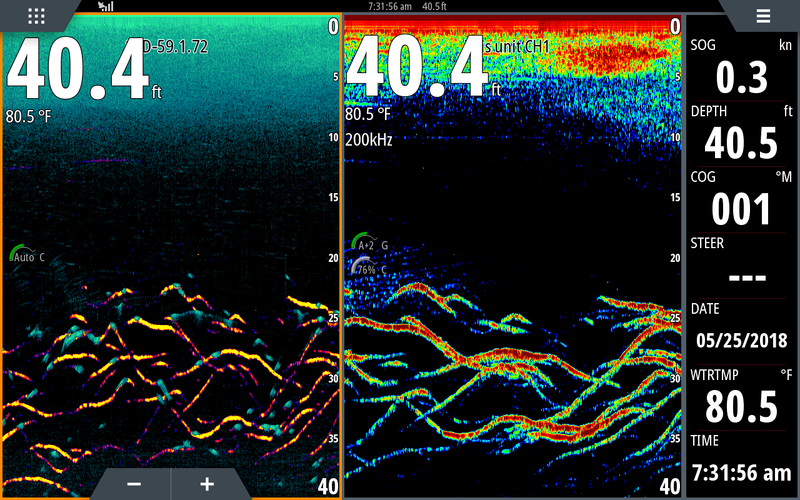 I am using side scan on my other Simrad mounted on the dash and saw out to the left more fish so I moved that direction and popped that shot of the picture above this one. This screen shot is an example of fish reveal on the down scan side of the screen. I was in 37 feet of water and went over the end of a roadbed where the bridge connected to it that was blown up before the lake was flooded. You can clearly see where the bank was undercut about 20 feet and a support under it. 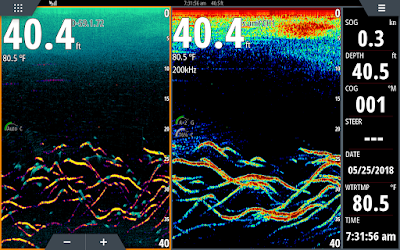 If you were using traditional sonar like the right side of the screen you would not be able to tell what it was. That’s very good tech. I like that it was made available as a software update. Very educational thank you.